Moroccan Artist Sapho recently performed, during a show at the Olympia, Paris, a Moroccan version of John Lennon's famous song 'Imagine'. The song was translated into 'Darija' (Moroccan dialect) by Dominique Caubet, teacher of Maghreb Arabic at the National Institute of Languages and Eastern Civilizations. The concert aimed to show solidarity with the French journalist Florence Aubenas and his Iraqi guide Hussein Hanoun, kidnapped in Iraq 47 days ago. 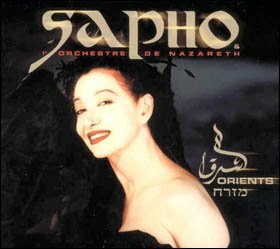 This concert was an opportunity for Sapho to express her feelings and to show her solidarity while performing this song, which was broadcast live on Monte Carlo radio for the Arab World. "Imagine" was John Lennon's second major release apart from the Beatles. Released on Sept. 9, 1971 (US) and Oct. 8, 1971 (UK), it has remained John's most commercially successful album. It was recorded primarily in John's home studio which turned out to be the last time he would ever record in England.